Hello friends! Three years ago, we thought of developing a tool to assist investors in research. We imagined a tool, which can exploit the modern web technologies to enable investors concentrate more on research than on procedures. Thus was born the Screener. Over three years, the application was written (and re-written) to make it as rich as possible. Screener is a modern finance tool to analyse and search new stocks. Quick snapshot of a company: Screener does a basic boiler-plate job by analysing the company’s financials, and presenting its strengths and weaknesses. Complete flexibility: You can calculate complex ratios on the fly and can customize comparative columns as per your requirements. Informative ratios: Screener automatically calculates complex financial ratios such as weighted-average return on equity, profit growth and sales growth. These are calculated for a period of 10 year, 5 year and 3 years to get a proper picture of a company’s history. Custom screens: You can provide your own search criteria in form of equations to search across all listed companies for such parameters. 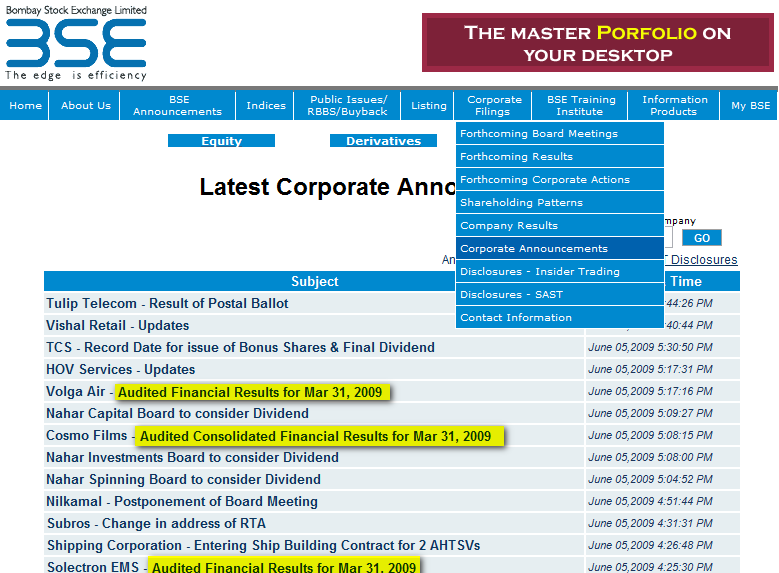 Set email alerts: You can set alerts for the stock screens to receive automated updates about latest quarterly results. Screener has many other rich features which allow you to add annotations, create dynamic watchlists and even create your own custom ratios. You can also use this guide to know more about the features of Screener. We hope you would feel a great pleasure in using the Screener. Please do not hesitate to leave a comment, if you feel any inconvenience in using it. Your suggestions from time to time will very helpful to us in improving this tool. Screener.in is a powerful and exhaustive stock screener providing complete flexibility to sort, arrange and customize the search results. 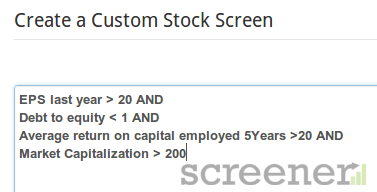 Screener also provides advanced options to save stock screens and also set automatic email alerts for them. Stock Screeners are tools to help us find the stocks based on performance. Though we recently said that we were yet to have a good professional stock screener, we were able to find many. In fact, we were unaware that even BSE had its own little stock screener. Here we compare and review the free stock screeners for Indian stocks. BSE India provides a small screener to find stocks based on the group, P/E ratio, EPS, LTP and Market Cap. The results are most up-to-date and accurate, however the options are limited. There are many sites which provide the stock summary of India stocks on one page including Money Control, Rediff Money Wiz, Sify Finance, Yahoo! Finance etc. However, Google Finance is what we liked the most, and potentially the best stock screener in making. For financials, economic times remains the best. This is one feature that separates Google Finance from all others. The price charts are very quick providing data for even 10 years (or more). These can be used to compare the prices of your favourite stocks with other stocks or even with the various Sensex. The carts also show the Dividends, splits, bonuses and other announcements in the timeline. Excel is one tool which we all have used more times than the calculators itself. Then why not get all the data of the companies on an excel sheet ? Awesome BSEXL is an attempt towards that. Using excel filters and advanced filters, you can create queries as you like and make the reverse processing possible (search companies which perform as YOU want them to perform). We have included the basic advanced filter by default (you can learn more about it at Microsoft site). Thus your capabilities are unlimited. The data currently in the sheet is only for past 3 years (however you can get data about the companies for more than 10 years here manually). Your comments are more than welcome for future developments. BSE India and other sites including Money Control, all provide the financial data of maximum 5 years. So what to do if you want the data of more than 5 years ? Economic Times provides the solution. 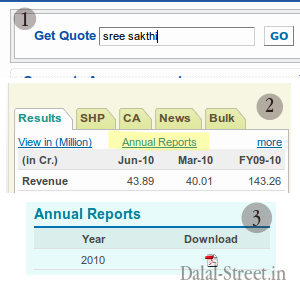 Economic Times uses multiple databases and provides the financial data even for more than ten years. The comparative data however only for the P&L Account and Balance Sheet. 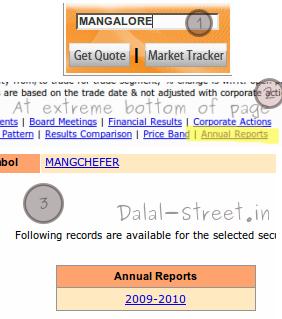 Same feature is not available for Quarterly results. Also, I wish if they had a feature to export this data into excel automatically. Apart from this, the service is quite useful, flexible and easy. Do share other sites (if any) that provide the long historical financial data for free in comments.